We stayed in a private room with shared bathroom. It was clean and the room was quite big. They have a nice pool area to hang around but the water is very warm and not refreshing... 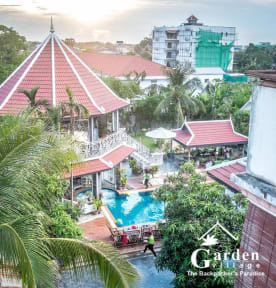 The location is perfect, only a few minutes away from the night market and the pub street! The food they offered was a little bit expensive, but the kitchen is open 24/7! Would stay there again. 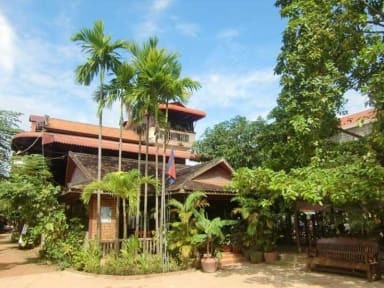 The hostel reminded me of a family holiday resort- very good place to stay for young families! The kitchen staff was very friendly and helping while the staff at the registration desk showed obvious desinterest in the guest's issues.... nevertheless, the room was great and so was the whole surrounding. Near pub street, nightmarket and a couple of Atm's. You can book cheap busses to Bangkok around the corner as well! The Swimmingpool is great and there is always something going on - good fun, great vibe and perfect for meeting new people. 24/7 bar & restaurant - that also means it is never quiet! 16 dorm is actually a 32 bed dorm, but much nicer than the 25 dorm! Das Hostel ist ok um neue Leute zu treffen. Leider ist das Wlan sehr schlecht und die Bedienungen unfreundlich. Private Room was less comfortable than expected. We were charged 1,5$ per persons per day extra for the AC. Room was never cleaned during our 3 days stay. The Pool area is nice though. Staff at the pool bar is very nice and the food and drinks were also quite good! The location is nice and some of the staff is helpful and friendly. The dorm room we stayed in had a much appreciated air conditioning and was relatively clean. But the bathroom was absolutely disgusting: dirty, moldy and the water coming out of the taps was rusty so you couldn’t even wash your hands without them smelling really gross.